Just because vacation is booked doesn't mean the research is all done. 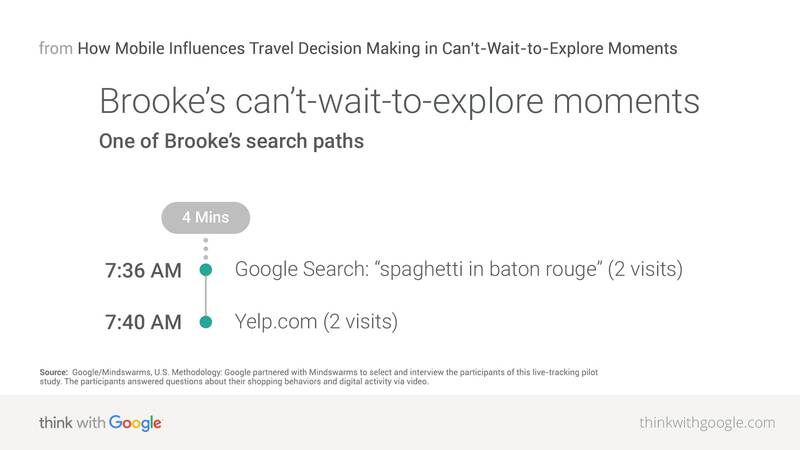 Part five of this six-part series on travel micro-moments dives into the can't-wait-to-explore moments that happen after travelers have booked—and how travel marketers can capitalize. When it comes to travel planning, that gleeful moment your itinerary is all set is when things start to get real. There's probably a moment when you can almost start to hear the waves crash on the shore, or see the fresh snow coming down on the mountain. Vacation. Is. Near. Now you can start to think about all the things you'll do and see while you're there. These can't-wait-to-explore moments occur when travelers start to look forward to their trip, and increasingly when they're finally at their destination. Travel marketers may think that a secured booking is the end of the road when it comes to serving travelers' needs. But providing useful information in these particular micro-moments is a way to build your brand, drive word of mouth, and increase loyalty among travelers. Online interactions are increasingly shaping how people make a plan for their next trip. 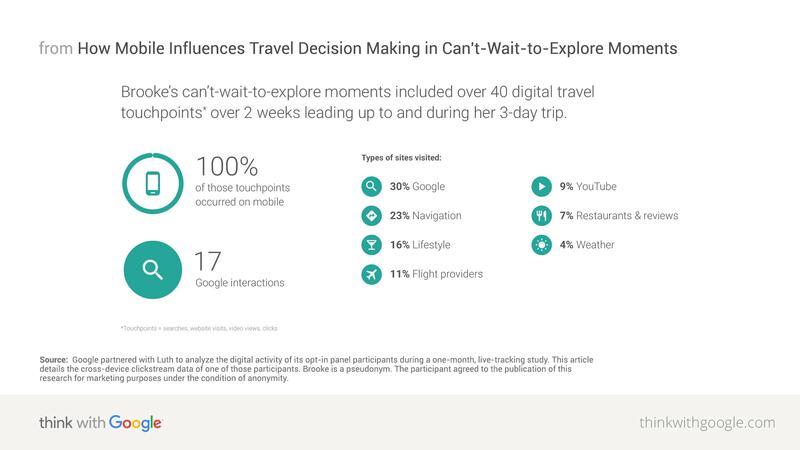 New clickstream data from Luth Research's opt-in panel (illustrating the pages a user visited, and in which order) provides a snapshot of what a real traveler's can't-wait-to-explore moments actually looked like. By analyzing this traveler's searches, clicks, website visits, and video views while she was gearing up for and experiencing her planned trip, we can start to see exactly how and how much digital played a role in influencing her destinations. Meet Brooke. Brooke is a 35-year-old mom who recently traveled from Tennessee to her alma mater in Baton Rouge with her family for a marathon. Source: Google partnered with Luth to analyze the digital activity of its opt-in panel participants during a one-month, live-tracking study. This article details the cross-device clickstream data of one of those participants. Brooke is a pseudonym. The participant agreed to the publication of this research for marketing purposes under the condition of anonymity. Source: Google Data, U.S., from Mar. 2015 to Mar. 2016. Make information accessible across sites and apps. In can't-wait-to-explore moments, travelers increasingly rely on mobile sites and apps. Travelers say they used mobile sites slightly more than mobile apps when looking for information while in a destination on a trip.5 And only 23% of travelers say they have downloaded the app for the travel brands they use the most.6 Encourage your customers to install your app, and provide them with content in the app to help them make the most of their trip. Hilton is a great example of a hospitality brand that bridges the physical and digital world for guests via mobile. The brand's aim is to make travel easier for its guests before, during, and after each visit. That's why Hilton now uses email markup. It lets Google recognize when a traveler has booked with Hilton, and as the travel date approaches it shows the guest a Now Card (essentially an alert on their phone) with hotel details and reservation updates. Hilton is also winning can't-wait-to-explore moments with its app that lets HHonors members at select hotels pick exactly which room they want, bypass the line at check-in, and go directly to their room, using the app as the key to unlock their door. Provide useful information for first-time visitors. Most travelers venture to destinations they've never visited before: 53% of leisure travelers say they chose a travel destination because they want to visit new places. And only 18% of leisure travelers plan to revisit places they've been. This is an opportunity for brands to be useful and to provide resources on a given area or tap into local knowledge. Airbnb is one such travel marketer that takes the opportunity to meet travelers in their can't-wait-to-explore moments and plays the role of local tour guide. To help travelers experience New York "like a local," Airbnb tapped into its vast hosting community to provide host-led audio tours of Midtown. When visitors searched for tourist destinations or things to do in the Times Square area, they were prompted to see New York with a Hosted Walk. The experience used Google Maps and the Directions API to direct users to their primary destination, while the Airbnb host's voice chimed in whenever they passed a great local spot along their route. This effort turned Times Square, once a notorious tourist trap, into a unique experience for any traveler. There's a lot more to learn. Check out this more detailed feature on Airbnb's approach to time-to-make-a-plan moments, including a video complete with interviews from the people driving this thinking for the brand. 1 Google/Ipsos Connect, travel playbook omnibus, base: U.S. travelers 18+, n=1,664, Apr. 2016. 2 Google/Ipsos MediaCT, "The 2015 Traveler's Road to Decision," base: U.S. leisure travelers, n=3,500, Aug. 2015. 3 Google Data, U.S., aggregated, anonymized internal data from a sample of users that have turned on Location History, Mar. 2016. 4 Google Data, U.S., from Mar. 2015 to Mar. 2016. 5 Google/Ipsos Connect, travel playbook omnibus, base: U.S. travelers 18+, n=1,304, Apr. 2016. 6 Google/Ipsos Connect, travel playbook omnibus, base: U.S. travelers 18+, n=1,304, Apr. 2016. 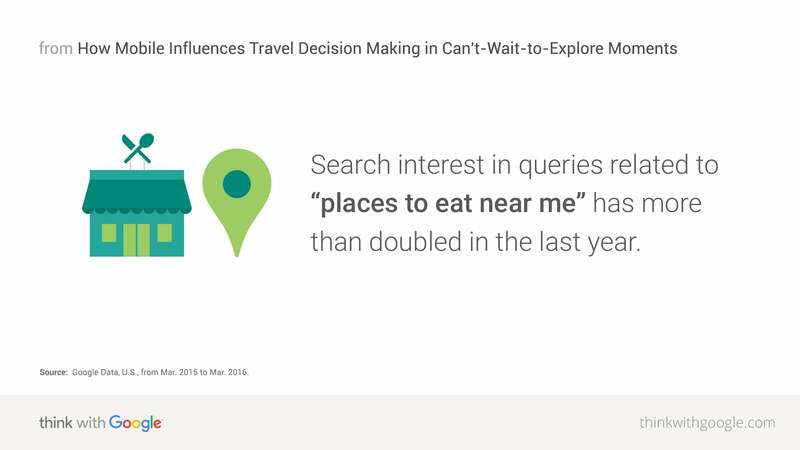 7 Google/Ipsos MediaCT, "The 2015 Traveler's Road to Decision," base: U.S. leisure travelers, n=3,500, Aug. 2015.